It is crazy to think that 9 months of this year was spent during a deployment. Ever since Scott got back from Iraq, we have been attached at the hip! While he was gone we missed many holidays, birthdays, and weddings. That’s the nature of the military – your spouse being away during quality family time. There are thousands of soldiers who are currently deployed and will not be able to be home during this holiday season. Since I know what it’s like having a deployed soldier, I also have an idea of what goodies to send during a deployment. I’m sure any deployed soldier would agree with me; pretty much anything beats the same old food they serve up at the dining hall. So just think how special receiving a personalized greeting card and a goodie bag would be 3-months into a deployment! 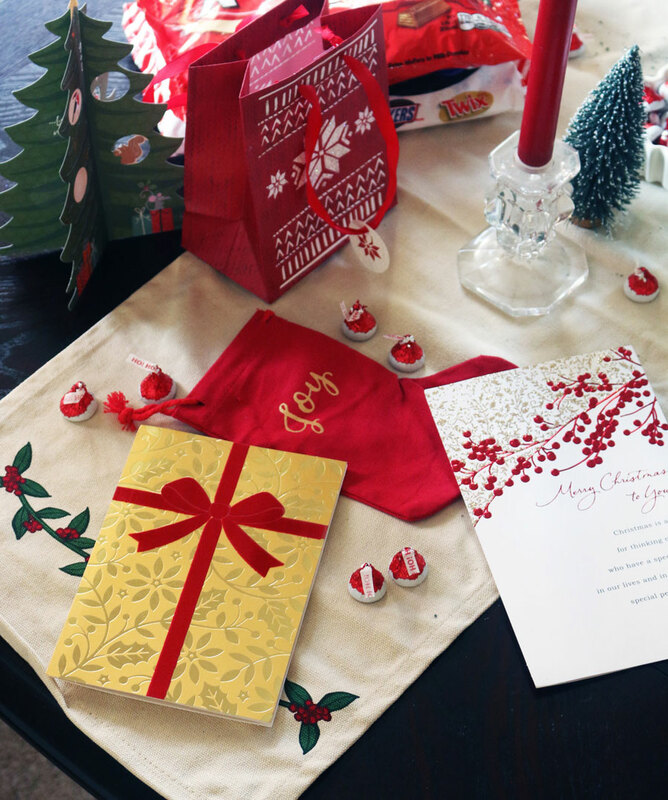 The best part is that you can grab all of these gorgeous cards and goodies at your local Target! I purchased everything seen here at Target, except for the candlestick holders and candles. Special shout out to the Target dollar section for all this cute decor! I think we can all agree that Target is the best “one-stop shop” for all your Christmas card needs! 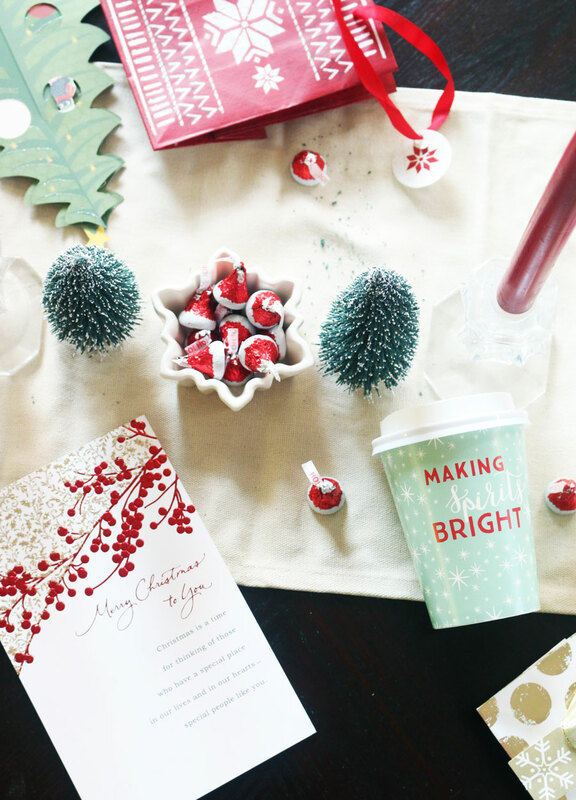 I had such a blast picking up little Christmas-themed goodies during my trip. 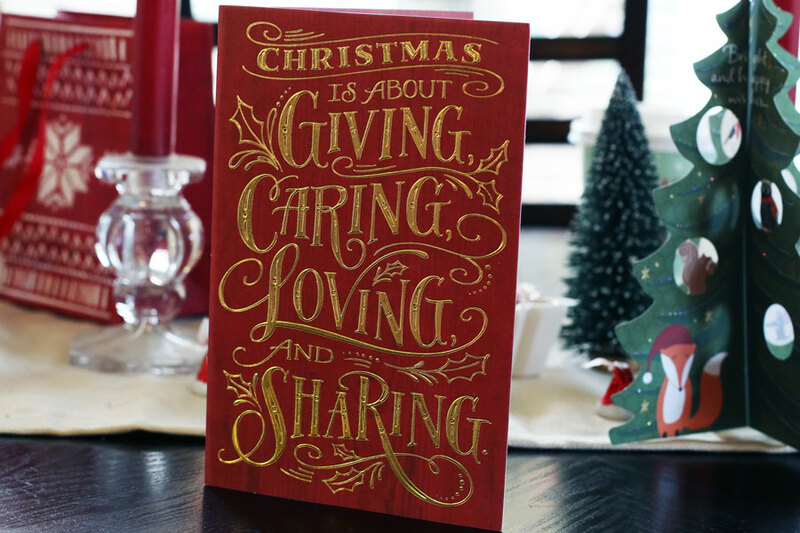 Sending Christmas cards is an easy and selfless way to spread holiday cheer, and a great way to let the bravest men and women of our country know that someone is thinking of them. I know there is nothing as special as spending time with your family during the holidays, so I wanted to send over some holiday cards to deployed soldiers to help ease those troubles. In this post I am breaking down what to include in a holiday care package to deployed soldiers. 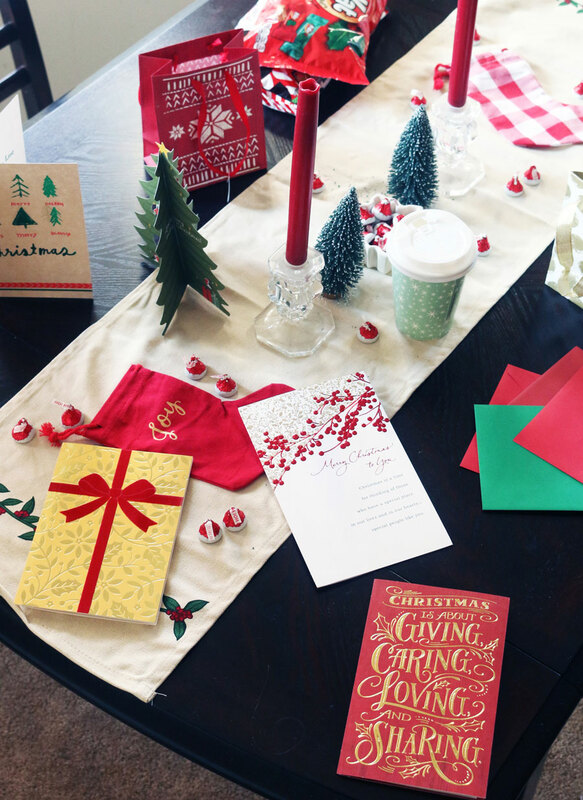 Cards – Check out these beautiful collection cards at Target! 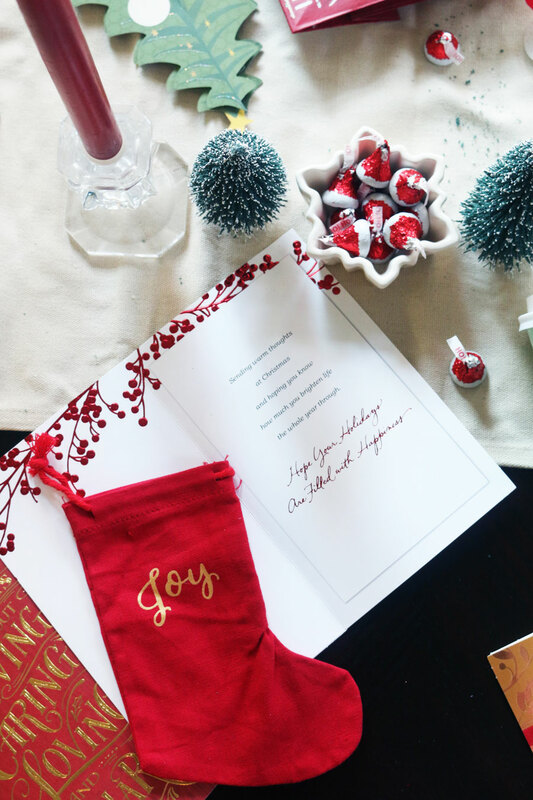 A few of my favorites are the Christmas tree card and the white card with red detailing. The entire card selection is so festive and memorable! Candy – Pick out some seasonal favorites to get the soldiers in the Christmas spirit. 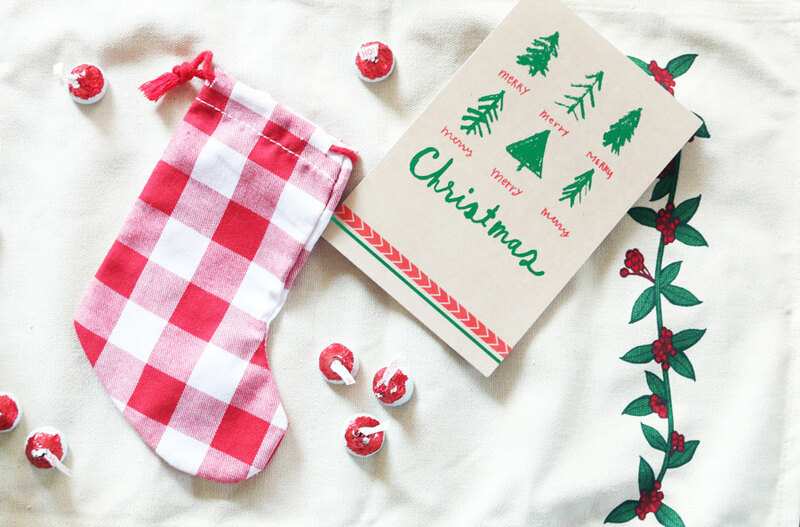 Try some candy canes, chocolates and more. Just make sure everything you send over meets the customs requirements. No perishables, no alcohol and no pork products are easy guidelines to use. 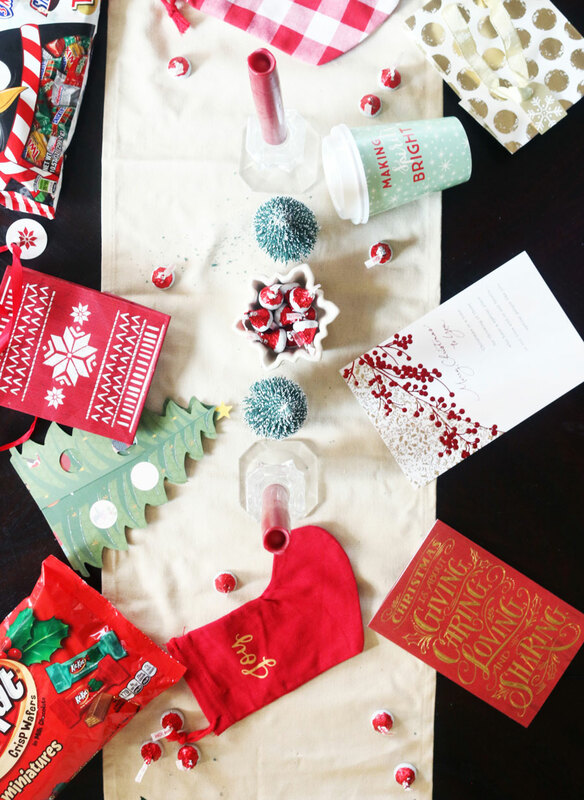 Goodie bags – I bought these little holiday gift bags for $1 at Target. You can fill them up with candy and treats, then fill them with stuffing and a card to really make the soldiers feel special. 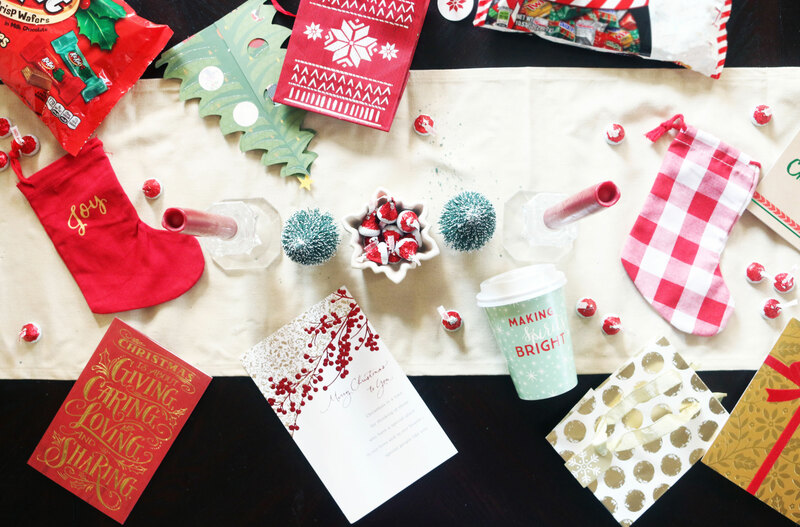 Who wouldn’t love a festive goodie bag full of candy and a sweet card? A thoughtful message – Deployments aren’t easy so anything to inspire a smile from a random person you don’t know would do the trick! Try getting in touch with your local church or boys & girls club to have volunteers fill out cards. Or even use this opportunity as a learning opportunity for your children – teach them a way to give in their own way this Christmas season! your local Red Cross to find out more information on where you can ship your cards and goodie bags! I’m so glad you’re able to spend time together this holiday season. I’m sure the holidays have a whole new meaning! Awww good for you! Happy that your husband is home! This is so sweet and thoughtful! This is so wonderful! What a kindhearted way to bless those who give all to us this holiday season. 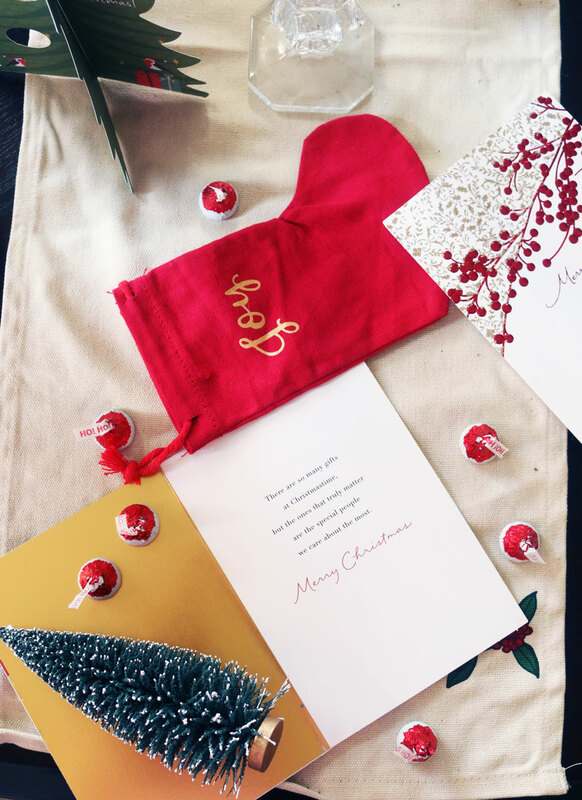 truly captures the joy of Christmas … beautiful flat lays !!! This is such a sweet and thoughtful post! Love it. Aww this is so sweet!! Love this idea. Love hearing these stories around the holidays. Glad you are together with hubby! great ideas and love those cards! This is the sweetest post! I love it so much! What a great way to spread the love the season, I’m sure this will make their day! This is such a sweet idea, I love giving back around the holidays especially! Love that your husband is back home with you. I love the idea of sending a Christmas package to deployed troops. AHH, I LOVE this so much. We can’t forget to send our love and holiday wishes to those fighting on our behalf. Such great ideas to do good for others this season! These cards look so pretty! What a thoughtful way to show the troops how much you appreciate what they do for us. I absolutely love this! We just did this at the office too and I had such a great time packing. So thoughtful and kind! I love the idea of the goodie bags! Such a sweet way to give back. And I absolutely love shopping at Target so you know I’ll be checking out all of these cards soon! These cards are adorable! Such cute set-up. This is so cute and a great thing to do as a special thanks to all our soldiers who are sacrificing their family time for being fighting for our country!